In this article on Macsimumnews, Dennis Sellers discuss how requests for features for the new iMac might be collected from Apple fans. Beside the interest about the technical features, it is nice to see how many designers and artists challenge themselves on the Mac playground. Mac computers are really something beyond the scope of a machine. They are a philosophy and a vision! It's my pleasure to announce that my research project on Kinetic User Interfaces will be funded by the Swiss National Fund for Scientific Research. This project is about an emerging paradigm in User Interfaces which is based on motion-awareness in physical space. By moving, people and objects can interact with computer systems. It is a way of taking the computer "off the desktop" as prospected by the Mark Weiser's vision of Ubiquitous Computing. 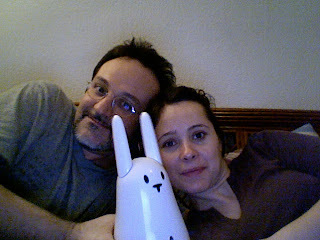 We just adopted one Nabaztag/tag! Nabaztag is a very basic social robot. It is only able to move the ears and display some lights on the body. However, it has nice communication skills since it is able to recognize speech and stream audio over the network. Moreover, the last version is capable to detect RFID tags (but this option is still not fully supported on-line). The main purpose of Nabaztag is to foster social relationships. In fact, after registering it in the website, you start receiving podcast (called Nabcasts) from other rabbits. You can find other rabbit owners in a public directory and start sharing nabcasts or other things... Very nice!! Adopt your Nabaztag and join Petrica in the NabWorld! This is about usability! 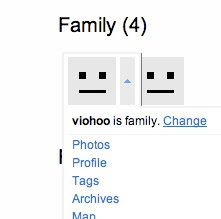 Have you ever tried to modify the category of one of your contact in Flickr, for example, making them friends or family? Once you learned is a quite easy taks! But how to figure out how to do it? That's the problem!! If you look carefully, there is no way of telling where this option is. You might discover it by chance. If you move your mouse on one contact's icon e pull-down menu is activated. Then you can choose the option you need. The possibility of opening the pull-down menu appears only after you moved the mouse over the icon. This is not good because the interface is not telling you what are the operations available until you don't explicitly select them. While Flickr is a great idea, it seems that usability of its website is rather bad. The contact icon has no affordance that tells you how to operate it. The concept of affordance is a basic one in Interaction Design and making explicit and intuitive the way of operating the interface to user is the most fundamental design principle one has to consider in order to build friendly interfaces. I hope Flickr design will soon realize their interface's flaw.